Last month, we featured the most coveted cheat sheet: the Google PM Interview. 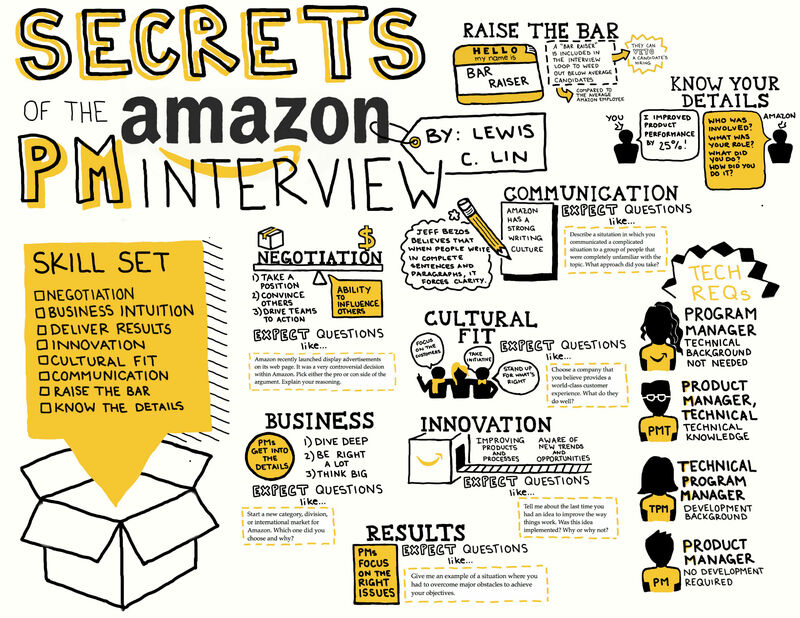 This week, we're introducing the cheat sheet MBAs need to pay attention to the most: the Amazon PM interview. Why? Amazon is hiring twice as many MBAs as any other tech firm. Aside from torrential job growth, there's another reason why MBAs should pay attention to Amazon; it's a phenomenal company to have on one's resume. What are the best tech companies to have on a product manager’s resume? More so than PMs at other companies, Amazon PMs are known to be absolute grinders. Amazon PMs, along with Amazon employees in general, are the only ones known to consistently work 60-hour work weeks. Many work more. Tough as nails, Amazon PMs will persist longer than others in impossible conditions. While Amazon is not as selective as lower-ranked companies (partly due to the fact they are on a hiring binge), an Amazonian’s grit is commendable and a big difference maker that edge Amazon PMs ahead of others. If I had an Amazon PM interview, and I could only bring one cheat sheet...this one would be it. Print out the high-resolution version of this cheat sheet, available in bothJPG and PDF.